During my investigation about this issue with the upstream version of sdhost, i've found a problem which affects downstream (bcm2835-sdhost.c) and upstream (bcm2835.c). after this strange IO errors occur, the ext4 journal is aborted and the rootfs isn't available. The sdhost isn't able to break free from this situation. As a band-aid for the upstream driver i made the following patch. This avoids the issue but is probably not the best solution. I assume you have (more) documentation about the sdhost controller to identify what's wrong here. what it thinks is a SEND_IF_COND command with an unexpected data block. the root filesystem is likely to have been unmounted. FSM by asserting the (self-clearing) FORCE_DATA_MODE bit. fortunate that the "fix" only modifies error paths. Thanks for the debug effort on this issue. Using an NFS root partition takes most of the pain out of SD driver errors, and network booting further streamlines the process. This is not an error I've encountered before since the normal MMC subsystem will avoid sending MMC_SEND_EXT_CSD to an SD card unless forced to. You are correct that we do have at least some documentation for the SDHOST interface, but it wasn't sufficient to stop the writing of the original downstream driver being an exercise in trial and error, and this fix is more of the same. The active ingredient in your workaround isn't the waiting - without prodding, the controller will remain in the READWAIT state indefinitely - it's setting the FORCE_DATA_MODE bit, which is enough to get the FSM out of the rut. See #2729 for two possible fixes. With those patches applied I can run the offending command in a loop with no apparent ill effect. Btw i tried my patched upstream version against the original issue from Ognian, but this one isn't fixed. The system seems to hang (heartbeat LEDs blinks fast). 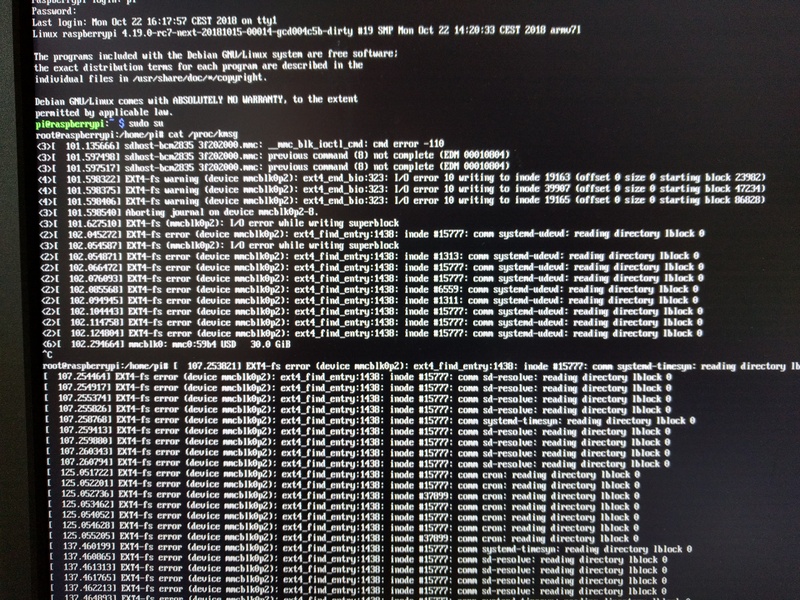 Okay, after applying ed6ceb0 and https://gist.github.com/pelwell/265baccf92ea4f2d8e47c4f9e1655714 on top of upstream 4.19, the MMC_SEND_EXT_CSD doesn't cause harm anymore on Raspberry Pi 3. In case of sdmon i'm getting timeout waiting for hardware interrupt for a SD card which probably doesn't support this command. [  267.988862] mmc0: timeout waiting for hardware interrupt. [  278.228798] mmc0: timeout waiting for hardware interrupt. I tested today 4.14.79 and sdmon with Apacer AP-MSD32GCA-1HTM, one of the cards capable of this commands. "error":"1st CMD56 CALL FAILED: Connection timed out"
[  106.071818] mmc0: timeout waiting for hardware interrupt. CMD18/CMD25 transfers will be used automatically by the MMC layer. Both ARCH_BCM2835 and ARCH_BCM270x are built with OF now. Enable Device Tree support for all architectures. Probe error handling is broken in several places. Simplify error handling by using device managed functions. Allow a different clock speed to be substitued for a requested 50MHz. This option is exposed using the "overclock_50" DT parameter. next being 125 (250/2) which is much too high. Also only warn once for each overclock setting. Make the bcm2835-mmc driver available for use on ARCH_BCM2835. Add Device Tree entry for bcm2835-mmc. In non-DT mode, don't add the device in the board file. doesn't need to claim two channels. BCM2835 has two SD card interfaces. This driver uses the other one. internal calls by the driver. 2) Reduce overclock setting on error. 3) Increase timeout to cope with high capacity cards. 4) Add properties and parameters to control pio_limit and debug. 5) Reduce messages at probe time. Also update pio_limit default in overlay README. removing the old code paths. expected behaviour, so reporting it to the user serves no purpose. that problem which ensures those sectors are always read singly. reading some sectors on certain high speed cards. 2) Better atomicity to prevent crashes. this is the only change which might have been responsible. reading one of those sectors and a subsequent data command. not be penalised by this workaround. into errors that can delay and even prevent booting. 2) Remove an unnecessary reset call from  bcm2835_sdhost_add_host. Get the definition of mmc_card_blockaddr from drivers/mmc/core/card.h. 2. using the exiting sd_overclock parameter. end results should be the same. explicit to cater for cases where the CONFIG setting is absent. to release the channel in the probe error path and on driver unbind. structures have been torn down. same in __device_release_driver(). Drop the duplicate assignment.